Plans have been unveiled to spend £137.3m on cycling and walking projects in Greater Manchester. A scheme to turn Levenshulme into a "mini-Holland" and a bridge linking bus and rail stations in Stockport are among 18 projects to be considered by transport bosses. Greater Manchester Combined Authority (GMCA) will fund £76.5m of the cost. The projects will form part of the region's Bee Network, aimed at encouraging people to walk and cycle. Greater Manchester Mayor Andy Burnham said investing in walking and cycling infrastructure would help the region "compete with some of the world's best and most liveable cities". Chris Boardman, the region's Cycling and Walking Commissioner, said: "We've got lot of very big schemes but the bit that I am most interested is in Leigh. "We've got a neighbourhood scheme where they have said, 'we want to change our entire estate, put in crossings and slow the traffic and make it a place where a competent 12-year-old can ride around safely and where a parent with a double buggy would want to walk through the streets,'" he added. The former Olympic cyclist conceded that Greater Manchester had lagged behind the capital in promoting cycling and walking but said he was confident they could reduce everyday car use on short trips. "If we put in thousands of crossing points around an area where there are a couple of schools we can enable people not to use their cars for those 1km journeys." Mr Boardman added: "I can almost guarantee that within two years we will be surpassing everybody." 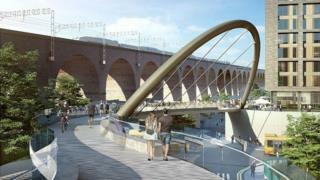 A £57m bridge would allow pedestrians and cyclists to walk or ride between Stockport's transport hubs, while a pathway would be developed between Manchester's Piccadilly and Victoria stations at a cost of £11.6m. In Levenshulme, pedestrians would be given priority over traffic, as part of proposals inspired by Dutch cities. GMCA's share of the funding will come from the Mayor's Challenge Fund, a £160m pot of cash allocated by the Department for Transport for the region between 2018 and 2022. The remainder will come from local authorities and other government grants including the Cycle Cities Ambition Grant. The proposals, which also include £14.6m of walking and cycling links in Leigh, Atherton and Tyldesley and the introduction of a Greater Manchester-wide bike hire scheme, will go before GMCA on 29 March. Bike-sharing operator Mobike withdrew from Manchester last year after losing 10% of its cycles each month to theft and vandalism.